Chandigarh 17th May:- Enabling the positive use of Artificial Intelligence for All was the theme of WTISD-2018 program concluded at The Institution of Engineers, Sector 19, Chandigarh and it focused on the potential of Artificial Intelligence (AI) to Accelerate the United Nations' Sustainable Development Goals (SDGs). SK Gupta CGM Punjab Telecom Circle, Chief Guest for the program said that in recent years there has been significant progress in AI technology, made possible by tremendous advances in contributing fields, such as Big Data, machine learning, computing power, storage capacity and cloud computing, among others. AI-based technologies are already emerging as a key component of pro active tools and applications being used to help people lead better lives by improving healthcare, education, finance, agriculture, transportation, and a wide range of other services. Er. J.R. Garg FIE, Chairman, Punjab & Chandigarh State Centre of the Institution of Engineers (India) welcomed the members and distinguished Guests. Quarterly magazine called Ëngineers Voice published by the institution was distributed to all participants, which highlights the forgotten engineer heroes of our society the latest addition had Sardar Karnal Singh who had immensely contributed to the society building rail links, bridges and restoration of war-torn areas. 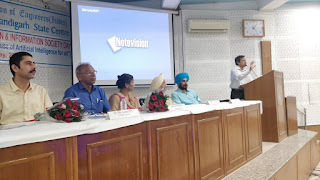 The key speakers of the program were Vivek Dua ITS, General manager BSNL who spoke at length about the benefits and challenges of artificial intelligence that is going to shape our society in the near future. Also Mrs Savita Gupta Director UIET highlighted the key benefits that the technology can bring to our development programmes of the society. She shared with the audience the changes that artificial intelligence is bringing to our routine life and carefulness that we need to observe while using all the gadgets that have artificial intelligence built in. The institution is going to have its centenary in the year 2020 and the celebrations for this will be starting soon through a series of program to be conducted countrywide .The local chapter also will be celebrating the 75th anniversary and various programs are planned in the engineering colleges and other places in North zone. Er. S.S. Mundi FIE, Honorary Secretary proposed Vote of thanks to all members present in the event.